By the end of its fourth season, The Simpsons’ best days, in terms of viewership, were already behind it. These are relative terms, you understand. The show would never again break the 30 million viewers mark in the US, as it did in the first couple of years, but each episode was consistently pulling in 20-25 million. And then, as the series moved onto its fifth, practically all of its writers left. 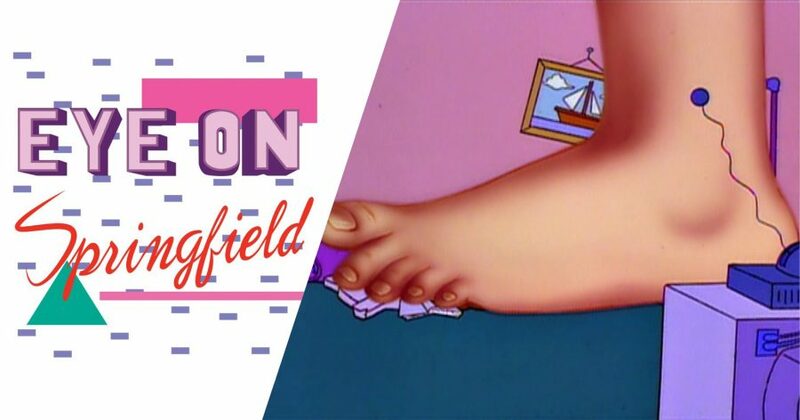 The mass exodus included Jeff Martin (3.12 “I Married Marge”), David M. Stern (4.1 “Kamp Krusty”), Jon Vitti (4.9 “Mr Plow”) and writing team Jay Kogen & Wallace Wolodarsky (4.17 “Last Exit to Springfield”). Al Jean & Mike Reiss (2.12 “The Way We Was”), who’d acted as joint showrunners for the last two seasons, also departed. As did Sam Simon, one of the show’s co-creators – and, depending on who you listen to, maybe more important than Matt Groening to the formation of the Simpsons as we now recognise it. That such a big chunk of the writing staff would jump ship from a series with 20-plus million viewers – by comparison, the single biggest scripted show on TV today, The Big Bang Theory, averages 18.5 million – might sound pretty surprising now. But the exodus probably wasn’t news to anyone working behind the scenes at the time. The Simpsons writers worked long hours down in the joke mines, and weren’t particularly well compensated for their contribution to the show’s enormous success. As their contracts expired, and many were offered lucrative deals to create their own shows, it was only natural they’d step away. That left The Simpsons with a small pool of experienced writers – which shrunk again when, early in the production of Season 5, Conan O’Brien was offered one of the aforementioned deals, to move from writer to presenter, and take over NBC’s Late Night talk show. To help right the ship, a new showrunner was hired. David Mirkin wasn’t promoted up from the writers’ room, like most other Simpsons showrunners. He didn’t even have any previous experience in animation – Mirkin’s history was in live action comedy, both traditional sitcoms like Three’s Company and more left-field series like The Larry Sanders Show. After four solid years, it really looked like The Simpsons was in trouble. So, how much of that comes through in the season itself? Season 5 does contain the seeds that would eventually blossom into what are commonly identified as The Simpsons’ worst habits. Right from the start, it leans heavily on celebrity guest stars playing themselves – George Harrison, David Crosby, The Ramones – and extended pastiches. The season opens with a run of episodes that lift their premises from, in no particular order: Citizen Kane, Cape Fear, Thelma & Louise, bad post-Animal House college movies, and the entire career of The Beatles. Cutaway gags also become much more prominent. These are one-off jokes that briefly jump to an unrelated scene – the format that would later be pushed to its limits by Family Guy. They often temporarily break the show’s reality, allowing for a fantasy sequence or a shorter parody. Like, for example, the end of “Rosebud” (5.4), where a robotic Burns snatches Bobo from the paws of a Planet of The Apes monkeyman. Over the course of the season, these breaks from normality start to become less temporary. Groening has often talked about The Simpsons’ “rubber band reality” as a strength, but he’s also quite vocal in his belief that this season stretched it to breaking point. 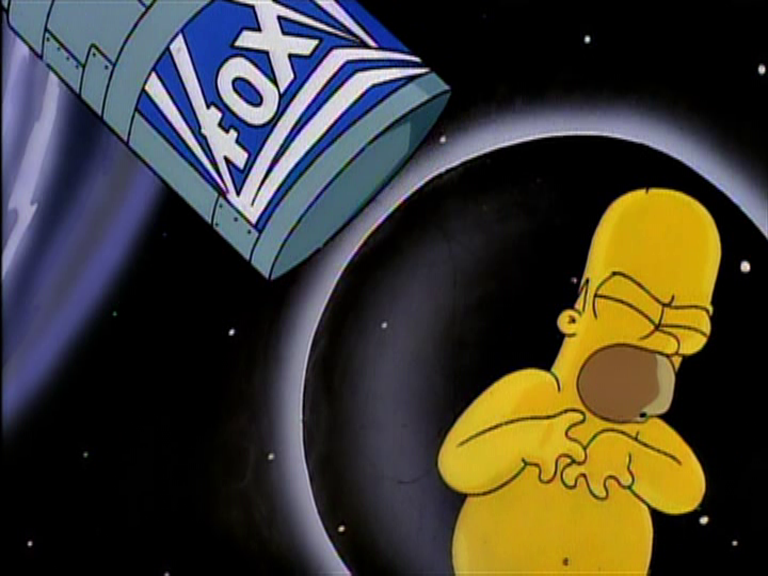 Specifically, in “Deep Space Homer” (5.15), where our schlubby middle-aged lead becomes an astronaut for 22 minutes. This is, as far as I’m concerned, a complex issue. On one (four-fingered) hand, this feels like the series fully embracing its cartoon nature. The early seasons, by design, could almost be a live-action sitcom. These jaunts into unreality expand its scope, visually and generically, in a way you simply couldn’t do outside of animation. It’s also, as the series runs on and on, at least partly necessary. After five seasons of The Simpsons, Bart is still ten years old. Time can’t move along, the situation can’t change too much, so in order to generate the hundredth new storyline within those confines, it’s helpful to have a little wiggle room in the show’s reality. And Season 5 is the point where The Simpsons decides to steer right into that. As mentioned in the Disenchantment blog, each episode of The Simpsons exists in essentially its own pocket universe. Not only are there very few story threads that pass from one episode to another, but here they start to gleefully contradict one another. Right from the very beginning of the season, “Homer’s Barbershop Quartet” (5.1) introduces a retcon to the family’s past that has never been mentioned before – that Homer was immensely famous for one summer after Bart and Lisa were born – and that’s difficult to reconcile with what we knew before, or what will come after. It’s a trend that that will culminate in the controversial ‘Armin Tamzarian’ reveal in “The Principal and the Pauper” (9.2). But we’ll get there in time. For now, though, Season 5 fervently hammers the reset button at the end of each episode. 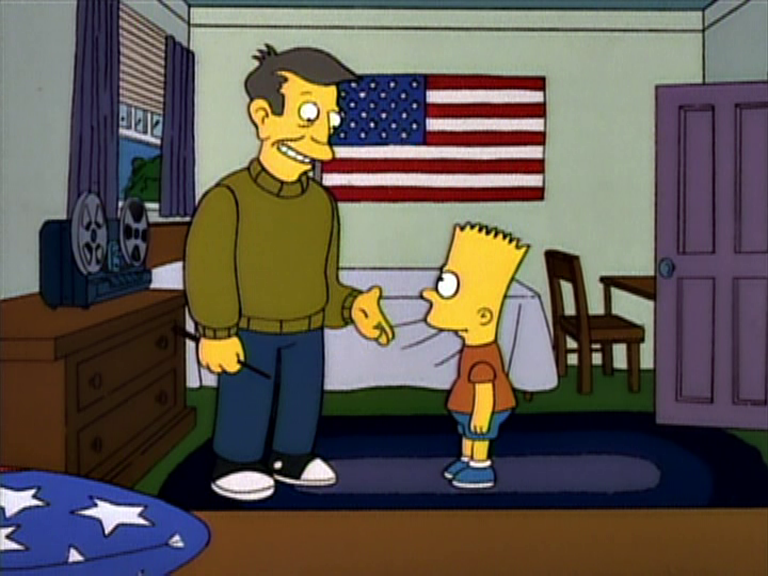 Look at the way “Sweet Seymour Skinner’s Baadasssss Song” (5.19) establishes a friendship between Skinner and Bart, acknowledging that they’ll have to return to their normal roles next week but ending on a genuine warm note. And then, one episode later, their rivalry is pushed to new heights in “The Boy Who Knew Too Much” (5.20). Yes, it’s self-aware. Yes, it’s the writers being aggressively clever about the whole thing. But it’s also a type of joke uniquely well suited to the Simpsons, a family whose experiences have – since the first season – always been shaped by what they’ve seen on TV. So I’ve no problem with their reality being punctured, as long as it doesn’t break the emotional consistency of the characters. Which brings us, finally, to the stubby yellow digits of the other hand. I’m not sure how much of it can be attributed to the above, but it really feels like the tenderness of The Simpsons’ early seasons has been lost by this point. Another possible factor may be that the conflict of these episodes is much more external. Stories entirely located within the family are much rarer, and the show starts to push the Simpsons outside of Springfield more frequently – their relocation to Terror Lake, Homer enrolling in college and, yes, going into space. This shift feels like another inevitability. Not just so the show can generate fresh stories as the episode numbers hit triple digits, but because the last couple of seasons did such good work establishing Springfield as a town full of screw-ups. The family need new contexts and situations they can be outcasts within. There are exceptions. “The Last Temptation of Homer” (5.9) and “Secrets of a Successful Marriage” (5.22) are great episodes about the problems in Marge & Homer’s relationship. The former introduces another tale of extramarital temptation – by this point, seemingly mandatory for every odd-numbered Simpsons season (see also: “Life in The Fast Lane” (1.9), “Colonel Homer” (3.20)). But overall these moments of domesticity, which in Season 2 were so good at getting me choked up, are increasingly rare. It’s a natural trade-off for this more reality-bending version of the show, one that puts much more weight on the jokes. Which, fortunately, are some of the funniest in TV history. Here’s the thing. I’ve been talking critically about the decisions that were made in Season 5, that forged The Simpsons into a different show – but those choices resulted in the some of the best episodes in the show so far. And that’s mostly down to the sheer quantity of laughs they each contain. Repeating jokes is tedious business, and frankly if you want that just hang out with me in person, but let’s look closely at one particular joke that permanently changed TV comedy: the infamous Rake Joke from “Cape Feare” (5.2). 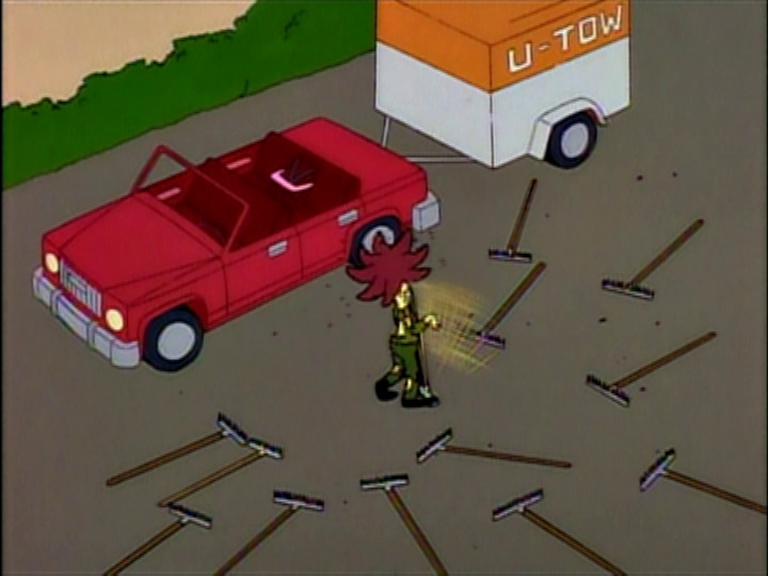 Sideshow Bob, already bloodied from hitching a ride under the Simpsons’ car, unstraps himself… and immediately steps on a rake, which hits him in the face. Bob lets out an exasperated “urrrrrghhhhhh”, turns around… and steps on another rake. “Urrrrrghhhhhh”. The camera pulls out to show a space inexplicably littered with rakes, and of course… Bob steps on another of them. “Urrrrrghhhhhh”. And then he steps on another rake. “Urrrrrghhhhhh”. Turns round, another rake. “Urrrrrghhhhhh”. Another rake. “Urrrrrghhhhhh”. Another. “Urrrrrghhhhhh”. And another. The camera cuts away, to inside the Simpsons’ new home, and in the distance we hear the familiar slap of a rake and accompanying “urrrrrghhhhhh”. 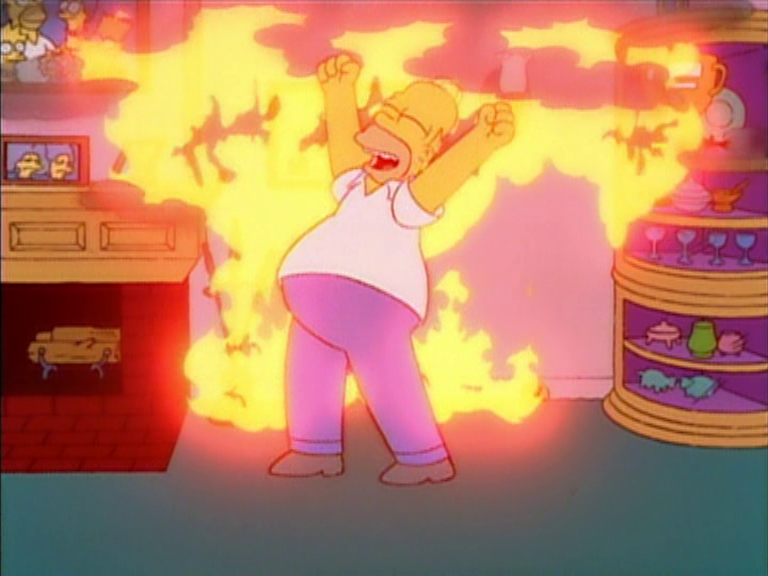 It’s a kind of humour that The Simpsons was already finding its way towards – Homer’s drop into, rescue from and subsequent fall back into Springfield Gorge from “Bart the Daredevil” (2.8) was edited into a longer, more violent version for its reappearance in “So It’s Come to This: A Simpsons Clip Show” (4.18) – but the Rake Joke really solidified the format. And thus, a new type of joke was introduced to mainstream TV. 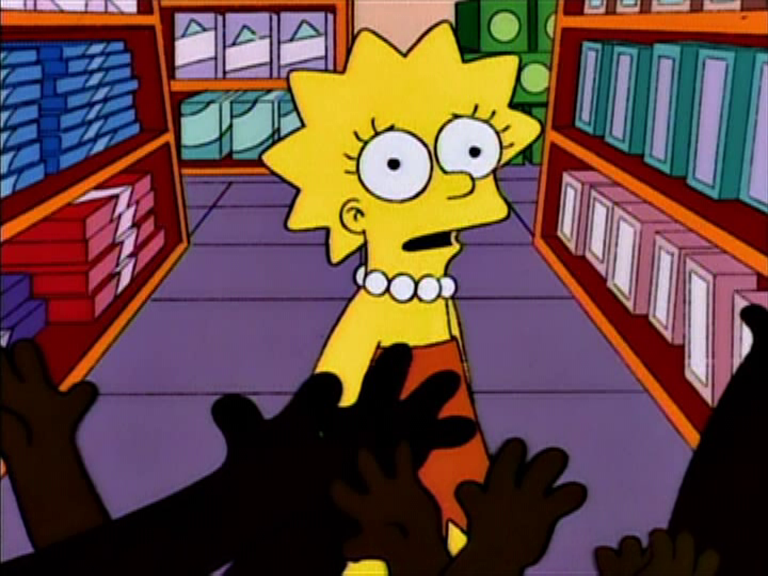 It’s not the best gag this season, or this episode, or even this act of the episode, but its long-term impact in spite of that – think of how many TV comedies since this have used this ‘repeat the funny thing until it’s not funny anymore and then until it is again’ format – is indicative of just how seminal the Simpsons joke machine was at this point. What’s especially interesting to me is that this joke was born out of necessity. It wasn’t originally written that way – but during production, when it became obvious the episode was running short, someone suggested extending out this scene to help reach the mandatory 22 minutes. Maybe the same can be said of the season as a whole. The mass exodus put the weight of writing on a smaller group of people, who happen to include some of the best staff The Simpsons was ever blessed with. Conan O’Brien left after writing twenty-eight minutes of the season. Bill Oakley & Josh Weinstein wrote ninety-five. John Swartzwelder wrote the other hundred and ten! I don’t want to romanticise what I’m sure were pretty long hours for those writers, but it did result in a strong, focused voice for the show. This is probably the most concentrated burst of running jokes in Simpsons history. Look at the introduction of Luigi and Baby Gerald, who are introduced in Season 5, make a few defining appearances in back-to-back episodes, and then more or less disappear. This singular voice is what keeps the series anchored, as it hops around between genres and realities. It might not be exactly the same voice The Simpsons had even a year earlier, but it’s one that is hard not to laugh at. The landmark one-hundredth episode of The Simpsons. Skinner gets fired and strikes up a friendship with Bart. A lot funnier than I remembered. Homer goes to college. He meets some nerds and befriends them, and hijinks ensue. The release of a sexist talking Malibu Stacy pushes Lisa to create her own doll, Lisa Lionheart. When Sideshow Bob returns (again), the family go into witness protection. Aware of his own mortality, Mr Burns adopts Bart as his heir, and tries to turn him against his family.